They were seconds short of making the Grand Final last season, can they take the next step? Robbie Gray: 9 of his 22 home and away games in 2014 he scored 100+ including some beast like scores of 137, 124 and 121. He further added 7 scores between 90-99. Retaining his dual position of Mid/Fwd and costing coaches $546,000 he doesn’t present the same value as last season, but your not selecting him on value, your picking him now as he’s clearly a top 6 scoring forward. The scary thing is he (along with his power team mates) can actually get better. Don’t be surprised if he doesn’t push his average over 100. Chad Wingard: When he’s on he’s unstoppable, but when he’s not he’s the most frustrating player to own. At $439,000 he is capable of placing the tons together as evidenced by the 3 he did from round 22 into the qualifying final. He’s also though capable of placing a run of poor scores together too as best seen from rounds 15 – 21 where he only once scored above 70 (76.) Some more midfield time and less of a reliance on goals will make him more relevant but with the forward riches at our finger tips it’d take a brave coach to pick him to begin with. 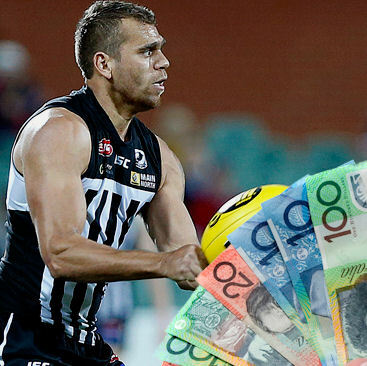 Nathan Krakouer: He’ll need to be upgraded but his Dual Position (Mid/Fwd) and his basement price make him one that should be on all fantasy coaches radars. After a short stint at the Suns he’s back where it all began with some unfinished business at Port Adelaide. He was impressive in his SANFL season in 2014 and is a chance of breaking into the Power team early. Kane Mitchell: The “Dark Knight’ of fantasy footy is now eligible as Mid/Fwd and at $397,o00 he is awkwardly priced. He’s got the potential to be a very dangerous fantasy player, scores of 119, 95, 91 & 89 this past season show us this. The thing about Kane though is he’s not safely in the Powers best 22 and because of this makes him very hard to select. Value for sure, but risky? No Doubt. Nice cheeky option in draft formats though. Sam Colquhon: We’ll need some cheap defensive options at D6,7 & 8 and Sam at $219,000 provides some value. During his debut 2013 he had a 3 game burst of 80, 87, & 74 and if he can find his way back into the defensive line of the Power he’s one to seriously consider. Great write up MJ. I could see one or two players make it into The Rogue Nutters at the start. If PP are hit hard by injuries they have few upgrade targets. 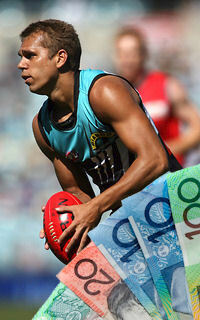 great article as usual am little confused but Nathan Krakouer is he 142k or 120k? the list says 142k but the picture narration says 120k? The one to watch is most definitly not san colquhoun, but in fact is Karl Amon. Dudes gonna explode on the scene this year. His running load is so elite at the moment every video all the stars are talking about him.